The 10th season of the Indoor Football League has nearly come to a close. It's been an outstanding season of triumphs, shortfalls and near upsets. 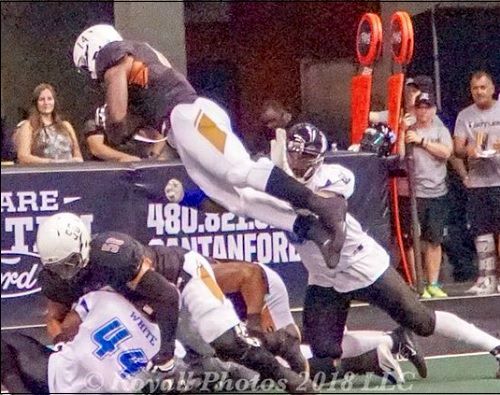 Three teams ended in a tie atop the final regular season standings with the tiebreaker ultimately coming down to strength of schedule, which elevated the Iowa Barnstormers to the top seed in the IFL playoffs. The Barnstormers are in their fourth season in the IFL and earned their second straight trip to the playoffs. After dispensing of the Nebraska Danger in the United Conference Championship game, Iowa not only advanced to the United Bowl, but will serve as host. 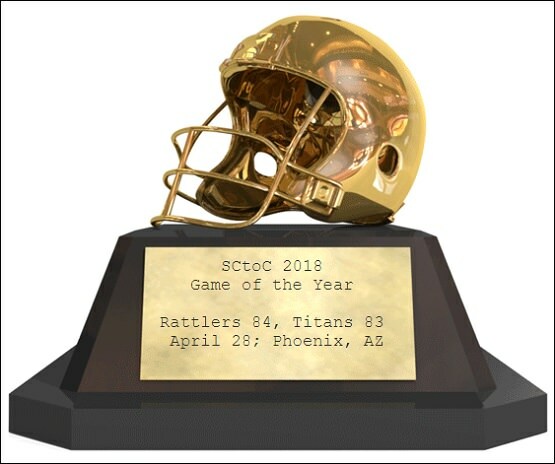 The Arizona Rattlers earned the second seed, which awarded them the opportunity to host the Intense Conference Championship game against the Sioux Falls Storm. After a thrilling 69-68 overtime win in that game, the Storm punched their ticket to their ninth straight United Bowl appearance. The United Bowl will be played on July 7 at 5:05 p.m. pacific time (7:05 p.m. central). As with every IFL season, there are several notable tidbits. One of which was, including the opening round of the playoffs, there were three overtime games played over the course of the 2018 season (one in triple-overtime). In each game, the winning team tallied 69 points, and two of those games were decided by a single point. Individual performances were abound all season long and in several games in particular. As we put together our 2018 Golden Helmet Awards, the six senior members of the Sports Coast to Coast (SCtoC) staff voted in eight categories to determine the top performers of the season. In the event of a tie (we had two of them), the tiebreaker came down to the votes of the three lead SCtoC staff who cover the IFL to determine a single honoree. Several had noteworthy seasons and moments and should be honored for those. We have attempted to encapsulate both the individual performances and how they came to be honored here on our pages. That said, the following are the Sports Coast to Coast 2018 Golden Helmet Awards. Drew Powell was our unanimous selection for this honor. The former Nebraska Danger signal caller came over during the off-season to replace the departed Travis Partridge and didn't disappoint. Despite playing just 12 of his teams 14 games (he missed two while working out for a Canadian Football League team), Powell led the league in total offense at 211.9 yards per game and in completion percentage at 68.1. He also passed for 1,604 yards (133.7 yards per game) and 34 touchdowns. He was, perhaps, even more dangerous in the running game, leading the IFL with 939 rushing yards (78.2 yards per game) and was third on the ground with 23 rushing touchdowns. All this, while leading the Barnstormers to a 11-3 record and the first seed in the playoffs. 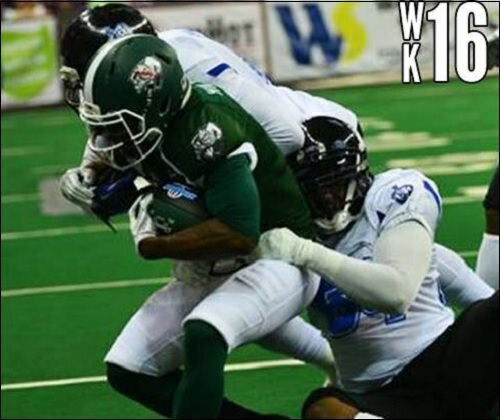 Powell earned IFL Offensive Player of the Week honors for weeks 1, 13 and 14. Bell exploded on the scene with the Titans in his rookie season. The 6'3", 250-lb. lineman from Shepherd University terrorized opposing quarterbacks and running backs. He led the IFL in sacks with seven for 67 yards (nearly 10 yards per sack). Bell also was tied with the Rattlers Joshua Gordon with 14 tackles for loss. He also was tops in the league with four forced fumbles, while recovering a pair of fumbles which tied him four fourth in the league. Bell was a bright spot for the Titans' defense and could very well anchor that defense in 2019. 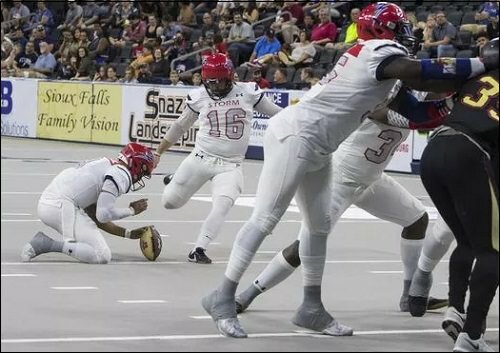 Bell earned the IFL Defensive Player of the Week honor in week 16. Titans' DB James Calhoun, Danger DB Darion Monroe and Barnstormers' DB Bryce Enyard received a vote apiece in this category. Coming off a four-game stint with the Colorado Crush in 2017 in which he hit all of his extra point attempts and went 10 of 12 on field goal tries, Bergner signed with the Storm during the off-season. He responded by hitting 64.7 percent of his field goal attempts with seven of his 12 misses coming from 50 yards or beyond; essentially a punt by indoor football standards. He hit a long of 45 yards twice. Bergner's 85.6 percent point after mark was second only to the Rattlers' Sawyer Petre. Bergner made 77 of 90 of those tries. He also averaged 43.4 yards on his kickoffs. Bergner earnet the IFL Special Teams Player of the Week honor in week 12. Blizzard kick returner (as well as running back and defensive back) B.J. Hill earns honorable mention in this category after receiving three preliminary votes among our panel. From the beginning of the season, the rookie from Florida International University became the early front runner in this category. His selection in this category was unanimous. Largely thanks to Medlock, the Titans were in several games this season and were just a win over the Danger away from earning a playoff bid. He completed 265 of 421 passes over the season (62.9 percent -- third in the IFL). He led the league with 2,613 passing yards and was far and away the leader in passing yards per game at 186.6. Maybe the most impressive is his 47 touchdowns against just eight interceptions. Medlock, who started all 14 games for the Titans this season, tossed a personal season-high six touchdowns in the Titans 84-83 loss to the Arizona Rattlers on April 28. 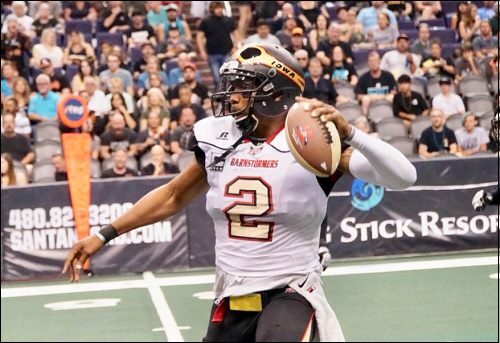 Medlock earned IFL Offensive Player of the Week honors in weeks 2 and 15. Bell did not give our panel much choice. How do you award a rookie as Defensive Player of the Year, then not anoint him as Defensive Rookie of the Year as well? He was just that spectacular during the course of the season. There were other strong candidates in this category who could have been as deserved, but his nose for opposing passers and ball carriers made him the favorite. In addition to his league-leading seven sacks and four forced fumbles, he tallied 31 total tackles. Despite some of the struggles the Titans had this season, lining up across from Bell was never something opposing offenses had on their respective wish lists. Titans' DB Darion Monroe and Storm DB Moses White each received a vote in this category. Prior to April 28, no player in IFL history had rushed for more than seven touchdowns in a single game. 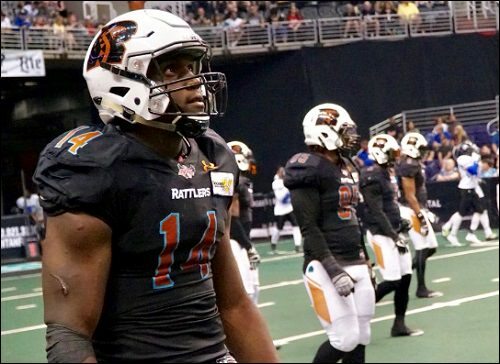 In the Rattlers' thrilling come-from-behind 84-83 win over the Titans, Monroe rushed for 11 -- count 'em, 11 -- touchdowns. In that game, he racked up 140 yards on 29 carries. A tribute to Monroe's punishing rushing style, he scored all 11 of those touchdowns from six yards or closer to the end zone. What's even more amazing about this performance was that he did not rush for a score in the first quarter, and had nine of those touchdowns in the second half. Monroe also led Arizona with seven receptions for 65 yards and rushed for a two-point conversion in that game. He scored the game-winning touchdown on a one-yard plunge with two seconds remaining. Monroe earned the IFL Offensive Player of the Week honor for that week 10 performance, as well as two weeks earlier, in week 8. Perhaps no one outside of eastern Iowa expected the 1-6 Titans to head into the "Snake Pit" in Phoenix and nearly steal a win over the defending champions. The Rattlers entered the contest at 6-1. The two outstanding offensive performances in the game came from Rattlers running back Darrell Monroe, who set the IFL rushing record with 11 touchdowns, and Titans quarterback Jake Medlock, who completed 12 of 13 passes for 210 yards and six touchdowns. Titans' running back Raphael Lawson-Gayle had 112 yards on 13 carries and two scores. After taking a 35-21 halftime lead, the Rattlers scored 56 second-half points, scoring on Monroe's one-yard run with two seconds left to emerge with the one-point win. It was an instant classic which saw Arizona rally from n 18-point deficit early in the fourth quarter to emerge with the home win. 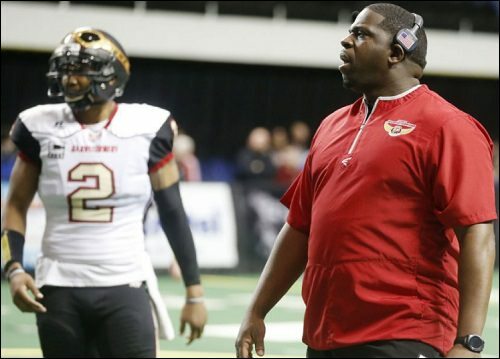 After going 13-3 and earning their first-ever IFL playoff berth in 2017, Coach Wooten led the Barnstormers back to the playoffs with the first seed (and, eventually, a home date in the United Bowl) this season. 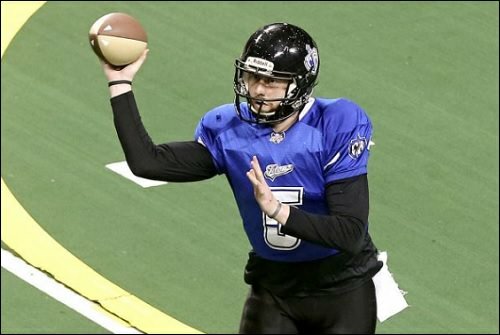 A unanimous choice for this honor, he was tasked with replacing the departed Travis Partridge, one of the better IFL quarterbacks a season ago. He brought in Powell and the offense didn't miss a beat. Additionally, Wooten built a stout defense which surrendered the fewest points in the IFL at 35.2. That same unit allowed just 211.3 yards per game, second fewest in the league. 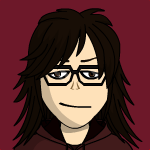 As a side note, SCtoC's Nevadanut is impressed by the fact that during the team's film watching and strategy sessions, Wooten is known to cook dinner for his players. He is 24-6 in the regular season as head coach of the Barnstormers. 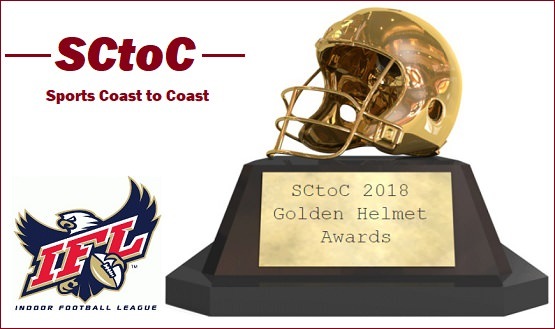 We at SCtoC would like to extend our congratulations to all of our 2018 Golden Helmet Award honorees, as well as all of those considered. We also would like to thank all the players, coaches, and individual team and league staffs for what turned out to be an exceptional and exciting IFL season. Our Season Schedule page has all the scores from around the IFL this season, as well as links to the boxscore of each game and links to our original recap of each game. There were some outstanding performances by not only those honored here, but by many players and coaches around the IFL this season. Congratulations to this year's Golden Helmet Award honorees!